President Muhammadu Buhari (right); Nigeria’s Ambassador to China, Amb. Baba Ahmad Jidda (2nd right); Imo State Governor, Owelle Rochas Okorocha (3rd right); Lagos State Governor, Mr. Akinwunmi Ambode (3rd left); Gov. Mohammed Abdullahi Abubakar of Bauchi State (2nd left) and Gov. Mohammed Abubakar of Jigawa State (left) at a parley with Nigerians living in China, on Sunday, September 2, 2018. 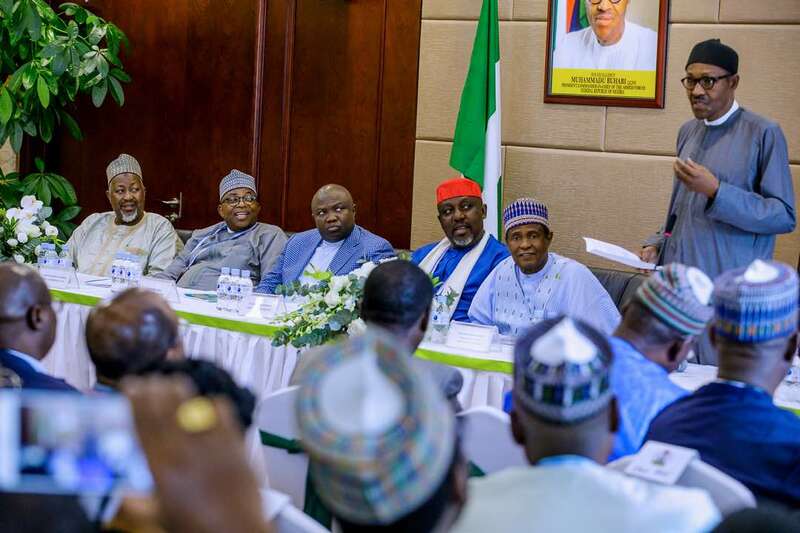 President Muhammadu Buhari (5th left); Minister of Transportation, Mr. Rotimi Amaechi (4th left); Lagos State Governor, Mr. Akinwunmi Ambode (right); his Zamfara State counterpart, Gov. Abdulaziz Yari (2nd right); Gov. 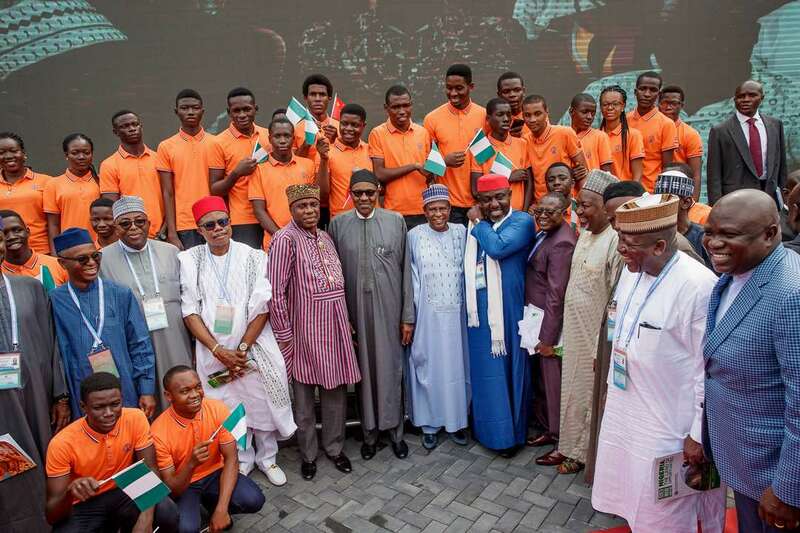 Mohammed Abubakar of Jigawa State (4th right); Imo State Governor, Owelle Rochas Okorocha (6th right); Nigeria’s Ambassador to China, Amb. Baba Ahmad Jidda (7th right); Gov. Willie Obaino of Anambra State (3rd left); Gov. Mohammed Abdullahi Abubakar of Bauchi State (2nd left); Gov. Nasir El-Rufai of Kaduna State (left) and others at a parley with Nigerians living in China, on Sunday, September 2, 2018. 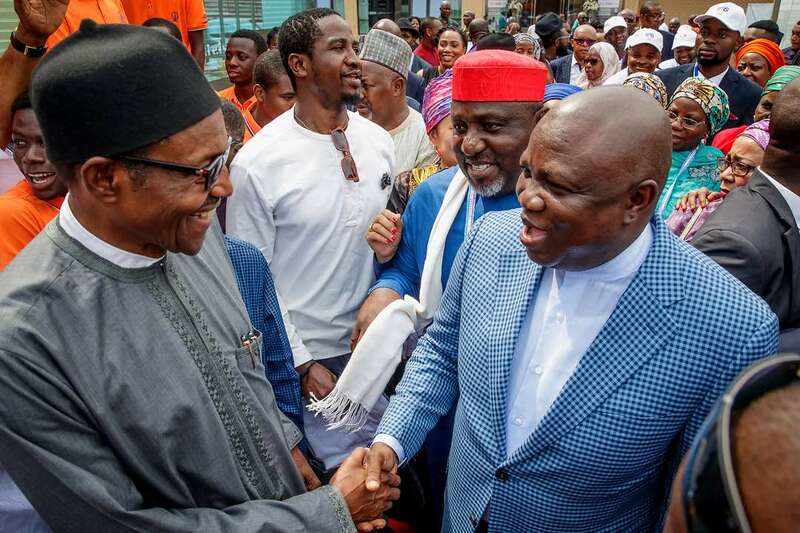 President Muhammadu Buhari (left), exchanging pleasantries with Lagos State Governor, Mr. Akinwunmi Ambode (right) at a parley with Nigerians living in China, on Sunday, September 2, 2018. With them is Imo State Governor, Owelle Rochas Okorocha (2nd right). President Muhammadu Buhari (middle); Nigeria’s Ambassador to China, Amb. 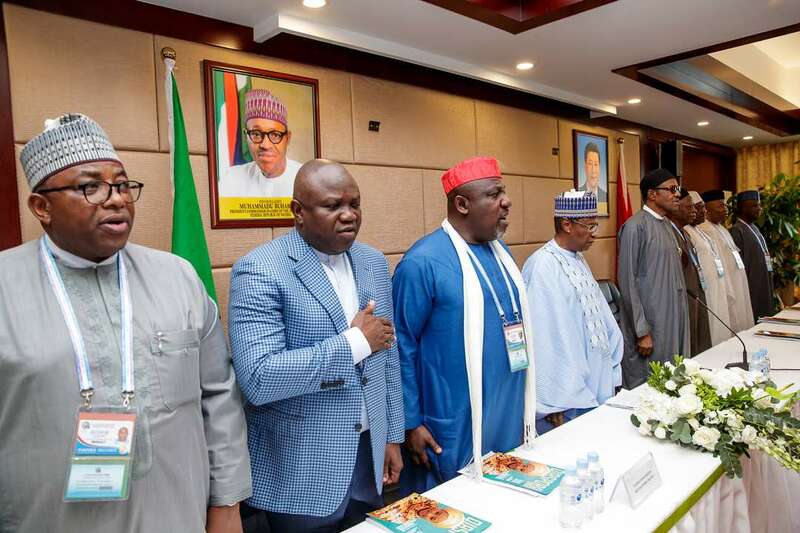 Baba Ahmad Jidda (4th left); Imo State Governor, Owelle Rochas Okorocha (3rd left); Lagos State Governor, Mr. Akinwunmi Ambode (2nd left); Gov. Mohammed Abdullahi Abubakar of Bauchi State (left); Senator Abdullahi Adamu (4th right); Senator George Akume (3rd right); Senator Godswill Akpabio (2nd right) and Senator Aliyu Wamakko (right) at a parley with Nigerians living in China, on Sunday, September 2, 2018.